I chose to do two very different mixes. The Chiana mix is probably more suitable to pop fans, while the Scorpy mix has alternative rock, punk rock and melodic metal songs ^^ (Try to look surprised that I picked Scorpy!) Also, the Chiana mix follows a pretty linear timeline, while the Scorpy mix is just random songs I think fit his character. An important point in Chiana's life was the escape from her home planet, away from the Nebari who she didn't fit with. So she left with her brother Nerri, and this is their song about how they were on the run with nothing else but each other to hold onto. Then she also lost her brother when they had to go their separate ways. From then on, Chiana was alone with nowhere to belong and nobody to love. This is the song I chose to represent that sad part of her life. For a home sweet, no sweet home"
With no sense of belonging"
And then Chiana met the rest of our crew and found people she slowly started to trust, and one she grew especially attached to. This song represents the blissful phase starting at the end of Home on the Remains, when she starts to open up to D'Argo, who then tells her she's safe with him. This is also an overall look into the brilliant character that Chiana is, with her many flaws that make her so much more real. I am opening up to you"
...But then things took another bad turn, as Chiana started to realize D'Argo wanted much more than she was ready give yet. This song represents how Chiana starts feeling anxiety, and wishes she could have D'Argo, but not too close; wishes what she has to offer would be enough. I'm only into this to enjoy"
The anxiety is growing and so Chiana decides to betray D'Argo to get out of this relationship that's clearly not for her anymore. She knows how wrong it is, but still seduces Jothee into it, knowing they'll both lose D'Argo. This is the song I chose for Chiana and Jothee. Ready to lose it all? Sure you want to play? This song reflects on Chiana contemplating what she's done, knowing that D'Argo will find out about her betrayal before too long. She knows she should have told him earlier that their wants and needs never really met, but also knows that what's done is done and their story is coming to an end. Tear everything we had apart"
So that's it for Chi, it's Scorpy's turn! 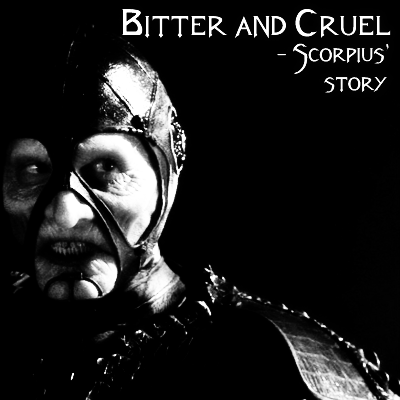 This is about Scorpius' sad childhood, being imprisoned by the Scarrans, and how it made him want revenge more than anything. Earmarked me, hurt me, burned me"
I'll see that all the hate you spread returns to you"
This one tells more about the effects that his cruel upbringing caused in Scorpius - he became only loyal to himself, and has always had trouble trusting anyone. A product of a broken home"
Even though this song actually tells about something else entirely, it always reminds me of Scorpius and the way he sees the Scarrans. For him, it's kill or be killed. The scene where he tells Braca how it must go - the Scarrans outnumber the Peacekeepers, and unless they do something about it soon, a war is inevitable - comes to my mind especially. oh can you hear them cry..."
I ain't gonna see you taken away"
This is a general song about Scorpius, especially the way he couldn't care less about getting blood on his hands and the hate and fear he inflicts in others. Red button and we'll all go"
An interesting point in Scorpius' story comes near the end of Peacekeeper Wars, when he finally sees with his own eyes the destruction that the wormhole weapons he desired so much can bring. He even admits 'this is insane' and looks truly happy when peace is accomplished. Somehow he came to change his attitude. There's no doubt he still despises the Scarrans and what they did to him, but he now sees that wormhole weapons don't prevent destruction, like he had thought all along, but create it. I chose this song to represent this point in his story. Your end is at hand, if they blow"
Your choices for both mixes are nothing but brilliant, and quite on-the-spot for both characters: the lyrics seem to be written with them in mind - it's something that never ceases to amaze me. Great mixes J_S! You really are a perfectionist! This must have taken you ages to put together...a really lovely job! Great song and lyrics choice and you introduced me to Sonata Arctica and their songs, which I had never heard before, so thanks for that! Both of them are so on the spot and well thought out...thanks for sharing with us! 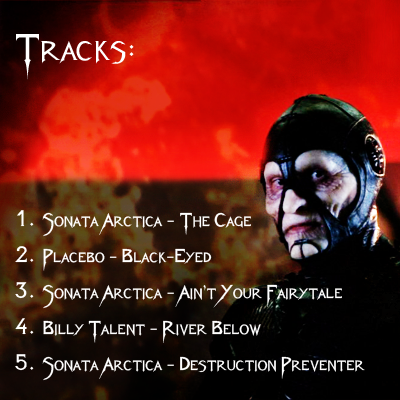 you introduced me to Sonata Arctica and their songs, which I had never heard before, so thanks for that! These are phenomenal! The art is fantastic, can't wait to listen to the songs... Lyrics seem spot on! WOW, these are great!!! I love how you really put a lot of thought into these!!! They both fit perfectly and I second that Sonata Africa is a great band (never heard of them before either), but my favourite was Mouth shut for Chiana!! SO GOOD!! VERY GOOD WORK!! And I'm SOOOO glad you're staying on FSL!!! Aaw, thanks!!! I did put a lot of thought into them (lol, as if I could do otherwise - I think about EVERYTHING way too much :D), nice that you noticed! I'll be listening to her all day. I enjoy so many of your choices here, for both fanmixes, but Rootless was the definite standout for me. I had wanted to do a D'Argo/Chi/Jothee fanmix myself but wasn't succeeding...I'm soooo happy you incorporated that and love the progression of songs. Her voice is incredibly reminiscent of Kate Bush's. Gorgeous. I'd LOVE to see a Sikozu video of Numb, so if you find the time, go for it!